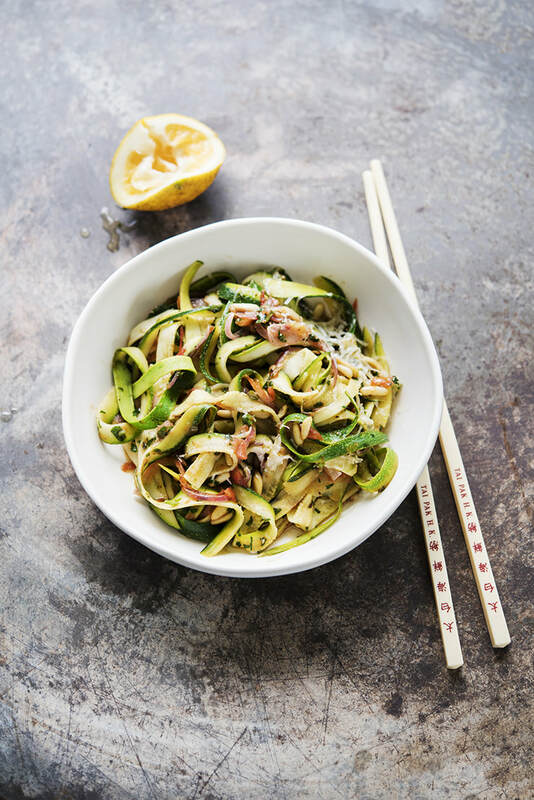 Zucchini Noodles, with a warm pine nut & herb dressing. Such a great way to use up home grown zucchini ... and carb free ! Make the zucchini noodles with a tool if you have one, or use a sharp peeler to peel away thick lengths of zucchini. Stack the slices together then cut the strips into thirds lengthwise. Heat a fry pan on medium heat, add olive oil and onions and sauté for 2-3 minutes until just softened. Add the pine nuts and stir to toast lightly. Add tomatoes; stir to cook for 2-3 minutes until they start to collapse. Turn the pan up to a high heat, add the zucchini noodles, fresh herbs and lemon juice and toss together until the noodles start to soften. Cook quickly until the flavours a mixed through, just a couple of minutes to keep the zucchini firm. Sprinkle over the parmesan and give a final toss. Serve as a side dish or enjoy as a vegetarian main course. Tip: Zucchini noodles will keep well in the fridge if kept in a glass covered dish on a damp paper towel.